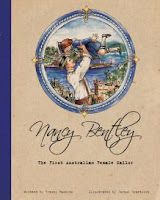 Nancy Bentley: The First Australian Female Sailor is a story filled with action, suspense and excitement, all the more for it being a true story. Six-year-old Nancy is on the shores of Port Arthur, dancing to the music coming from the ship in the harbour. As she runs home for tea she slips in the long grass and a poisonous whip snake bites her. Too far from medical treatment, Nancy's father rows out to the HMAS Sydney and Nancy is cared for by the ship's surgeon. However, the captain has a dilemma. In 1920, females are not allowed aboard a naval ship. He solves this problem by enlisting Nancy in the navy. She has become Australia's first female sailor at six. Nancy recovers but before she is discharged, from the surgeon's care and the navy, she sails to Hobart and attends a night at a picture theatre with fifty of the ship's crew. Tracey Hawkins' text moves along quickly as she takes the reader on Nancy's unique journey. Jacqui Grantford's watercolour illustrations add to the story and the picture of a limp Nancy in the arms of her father when they first board the ship clearly demonstrates the seriousness of the situation. This snippet of Australian history is bound to delight and astound children. There is a biography of Nancy Bentley at the back of the book and it wasn't until World War Two that the next Australian females were allowed to join the navy (Women's Royal Australian Naval Service). Thanks for the lovely review Vicki. Glad you enjoyed the book. Absolute pleasure. Books like yours are the perfect way to allow kids to explore our history. Thanks for dropping by BWB.